Exams are over and it’s almost time for us to fly back to the US for what promises to be an absurdly (but not at all unexpectedly) warm Christmas. Like, 70F and sunny, guys. It’s going to be great. In the meantime, here is your weekly moment of Icelandic Christmas zen. I remember hearing this song as a little kid, sitting down on the Living room sofa and staring at the tree with all the presents under it and looking into the kitchen, where my dad was hard at work, preparing the Christmas Turkey. I looked out the window and all I saw was black. It was pitch black outside even though It was only about 17:20 in the evening. As I looked out the window…It suddenly began to snow. Little puffs of white slowly drifted down to the ground behind the window. What I felt at that moment, I can only describe as the spirit of Christmas itself. The complete and utter happiness, calmness and all around love I felt was overwhelming. I felt incredible. I hope you will find this feeling this year too. Have a merry christmas everyone. It’s a little belated now, but upon mentioning it in my ‘hi, I’m still here’ post a few days ago, I happened to realize that back at the end of September, I actually published my first cover story with The Grapevine. The story—a profile of two women who have worked really hard to build an authentic street dance culture here in Iceland—was a long time in the making and I was not only proud of how it came out, but also just really interested in the subjects themselves. So I think it’s worth sharing, even if it isn’t hot off the presses at this point. You’re a Dragon. Got that? So, we’ve started doing presentations in my Phonetics and Phonology course (barrel of laughs that, I assure you), all of which are meant to demonstrate something about pronunciation for the rest of the class. Two of the first three groups actually ended up using the same clip for their presentations, a skit from the fabulous (and not yet available in English translation, I think?) sketch comedy show, Fóstbræður (Foster Brothers), which starred Jón Gnarr and (film director) Benedikt Erlingsson among others. The gist of the video is that Jón Gnarr comes into the office and is told by his boss (Benedikt Erlingsson) ‘Þú ert rekinn,’ which means, you’re fired. But what he hears is “Þú ert drekinn,” or you’re a dragon. Hilarity ensues, particularly for all us útlendingar who are pleased that Icelandic pronunciation isn’t always clear to Icelanders either. Last week, a number of archival videos of Iceland started making the rounds, after the former British newsreel production company, Pathé, uploaded all 3,500 hours of its historic footage to its YouTube channel. A number of the videos included were of Iceland, and they were hilarious. One of the Grapevine’s interns combed through the many videos and transcribed some of the better quotes (For a nice change of pace, I actually got to help with “translating” these, as, being a non-native English speaker, the narrator’s nasally accent and old-timey Britishisms were occasionally unintelligible to her [and to me for that matter]). After the relative success of our first “Uncommon Adventure” video, we set out on round two yesterday, this time on an adventure of a much different, much more old-timey tenor. We had been brainstorming a variety of ideas (some of which, like surfing, I opted out of) and spinning off of my desire to learn how to milk an animal, my filmmaker colleague Hallur decided that perhaps we should visit Árbæjarsafn, Reykjavík’s Open Air Museum, and get them to teach me some traditional húsfreyja, or housewife, skills. Rome wasn’t built in a day, and neither am I going to become a really bang-up domestic worker in an hour, so we kept it simple and decided we’d stick to two tasks: spinning yarn and churning butter. I’ll be writing about this in more detail later—and there will be a video, too, of course—so I won’t go into too much hilarious detail about this except to say, spoiler-alert: this stuff ain’t easy. Spinning yarn is like the original multi-tasking nightmare: you have to pulse your foot on a peddle at a steady and somewhat unnatural rhythm, while gently twisting the carded wool into a thread which you feed into the spindle with your hands. It was very quickly determined that as a potential housewife, I had better have other skills on offer, because my yarn technique wasn’t going to nab me any husbands any time soon. 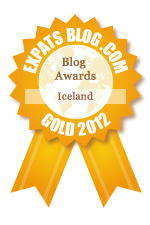 If you have ideas for future adventures or interesting people to meet here in Iceland, do share! I am coming a bit late to the Páll Óskar partý, perhaps because the album of his I picked up at the library last year was distinctly not-dancey, and that was what I had been in the mood for. So I kind of gave up going through his extensive catalog. Which was obviously a mistake because there is nothing I don’t love about the song and video above (for “Better Life”). The choreographed musical dancing—and that dance! I am learning that dance—the huge, cartoon smiles, the piano on a truck, the crazy colors…Love it. Anyway, I was looking for something completely different on YouTube the other day and stumbled across this song because the universe is awesome sometimes, so you all get to reap the benefits.